The deadline for our Dub's Dread customers to select their Google Fiber service plans is coming up this Thursday, November 15th. So, to sweeten the deal even more, we're adding new channels to our lineup—again. Whether you're searching for stock tips or workout tips; whether you're looking to check off your holiday shopping lists or looking for shows for the kids; whether you want to catch some football or some fútbol, we've got you covered. Central Library (downtown), 14th West 10th St., Kansas City, MO, 1:00 p.m. - 5:00 p.m.
Union Station Grant Hall, 30 West Pershing Rd. #400, Kansas City, MO, 1:00 p.m. - 5:00 p.m.
Main Library, 625 Minnesota Ave., Kansas City, KS, 1:00 p.m. - 5:00 p.m.
Northeast Branch Library, 6000 Wilson Rd., Kansas City, MO, 1:00 p.m. - 5:00 p.m.
Outside Papa Lews Restaurant, 2128 East 12th St., Kansas City, MO, 1:00 p.m. - 5:00 p.m.
Nutter Ivanhoe Neighborhood Center, 3700 Woodland Ave., Kansas City, MO, 1:00 p.m. - 5:00 p.m.
Bluford Branch Library, 3050 Prospect Ave., Kansas City, MO, 11:00 a.m. - 2:00 p.m. Miracle Temple Church, 2106 Quindaro Blvd., Kansas City, KS, 12:00 p.m. - 3:00 p.m.
West Wyandotte Library, 1737 North 82nd St., Kansas City, KS, 1:00 p.m. - 5:00 p.m.
Dollar General parking lot, East 73rd St. & Prospect Ave., Kansas City, MO, 2:00 p.m. - 5:00 p.m. Loose Park, West 51st St. & Wornall Rd., Kansas City, MO, 1:00 p.m. - 5:00 p.m. Plaza Library, 4801 Main St., Kansas City, MO, 1:00 p.m. - 6:00 p.m.
Our Fiber Team will also make stops throughout the week in various Kansas City fiberhoods, so please say hello, pre-register and spread the word if you see us. And as always, we’re at the Fiber Space at 1814 Westport Rd. to assist you. Stop by at any of these locations. We’d love to see you!
. 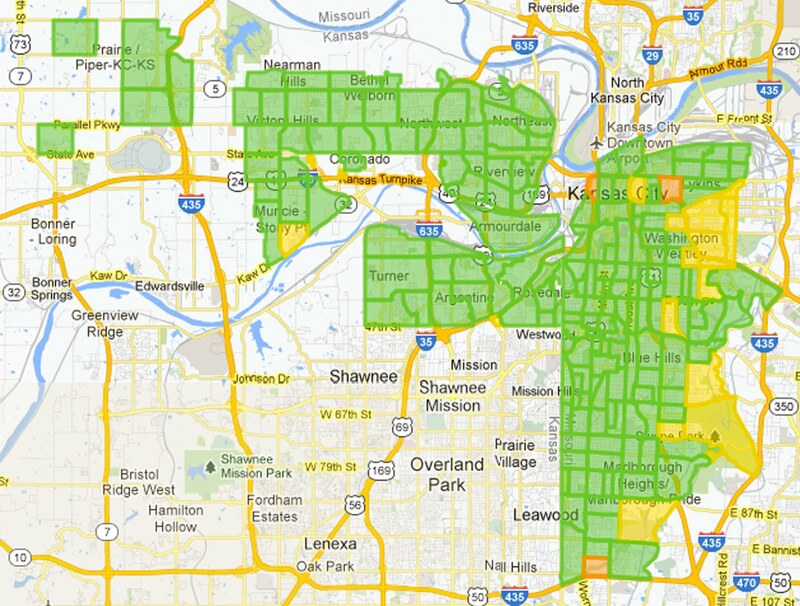 Out of these fiberhoods, the ones that are below their pre-registration goals are now closer to getting qualified. For the affected fiberhoods that were already past their goals, they now have a higher pre-registration percentage, which means they may get fiber sooner. You can look on our Kansas City, Kan. Fiber page or our Kansas City, Mo. Fiber page to check on the status of your fiberhood. Many thanks to the Kansas Citians who followed up with us about their fiberhoods. It’s really helpful to have your feedback and suggestions! There are only 9 days left until the end of pre-registration, so hopefully some of these new goals will encourage you to pre-register now and help your fiberhood to meet its goal. In the meantime, come visit us if you have any questions. We’ve said for awhile now that Google Fiber will offer a different experience than other Internet and TV providers. Our Internet is 100 times faster. Our TV has hundreds of channels in crystal clear HD. And we’re offering quality service plans that are affordable. But aside from offering a good product, we’re also trying to be different in another way—we want to listen to customer feedback and implement it into our service. So, when some Kansas Citians asked us to review their pre-registration goals, we listened. Our build-by-demand model is unique. It will keep our prices low by using efficient networking and construction processes. And, in order to make it work, we need accurate data to define the number of residential addresses in each fiberhood. Since we were hearing some concerns about pre-registration goals, we sent our street teams back out into Kansas City, Kan. and Kansas City, Mo. to figure out what changes we needed to make. Counting and confirming addresses in this way is actually a pretty difficult process. We found that, while we’d relied on a variety of sources to determine how many residences were in each fiberhood, the data wasn’t 100% accurate—specifically around vacant lots, abandoned homes and large apartment buildings—and therefore affected our pre-registration goals. Based on our new (and better) data, we’ve decided to adjust some fiberhood pre-registration thresholds. The changes slightly affect 73 fiberhoods. 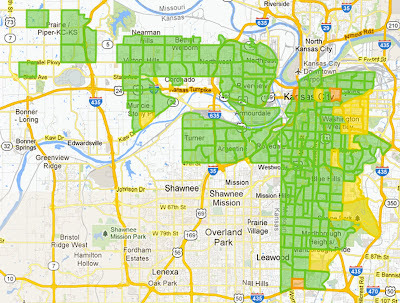 Out of these fiberhoods, the ones that are below their pre-registration goals are now closer to getting qualified. For the affected fiberhoods that were already past their goals, they now have a higher pre-registration percentage, which means they may get fiber sooner. You can look on our Kansas City, Kan. Fiber page or our Kansas City, Mo. Fiber page to check on the status of your fiberhood. Your first TV box - plus the Nexus 7 Tablet - are included for free in the Gigabit + TV package. For those of you who want Google Fiber on multiple televisions in your home, you can add extra TV Boxes for $5 each/month for 24 months. You also have the option to purchase TV boxes upfront for $120/ea. Extra boxes include a standard remote control but not a tablet. What will the wiring and equipment look like? I don’t want my Fiber installation to affect the aesthetics of my house! We hear you! We made our devices sleek and small so they don’t overtake your living room. We want you to notice Google Fiber’s high speeds and great experience, not the wiring or devices. At first, the majority of our work in your fiberhood will be outside, getting Google Fiber ready to bring to homes. 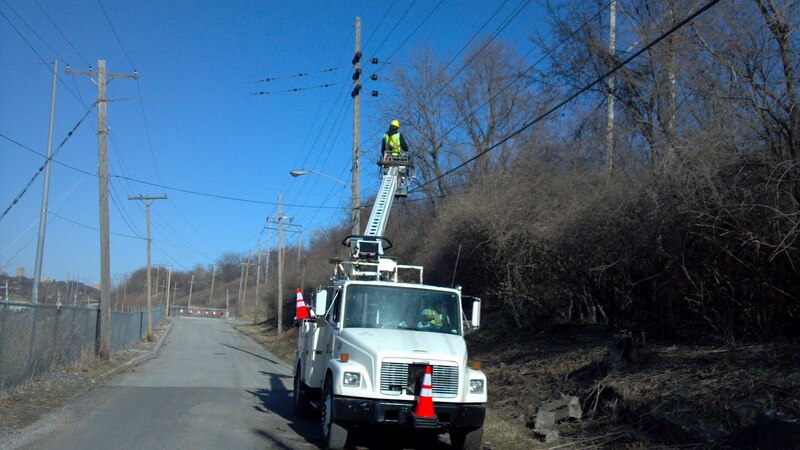 We’ll be stringing Fiber on utility poles, and, in some cases, installing it in the ground. Next, we’ll bring our Fiber connection from the street to the side of your house. This will happen before your scheduled installation appointment, but we will let you know that we’re coming and knock on your door before we go to the side of your house. Once Fiber is connected to the side of your house, we’ll contact you to schedule your installation. On your installation day the first thing we’ll do is drill a hole (tiny) in an exterior wall to bring the fiber inside. Then, we’ll cover the hole with a mounted wall plate and Fiber Jack on the interior wall. The Fiber Jack, which is about the size of a deck of cards, will convert the fiber into a gigabit Ethernet connection, which will then connect to your Network Box. The Network Box is your Google Fiber router, enabling wired and wireless connectivity to all devices throughout your house. You get to decide where everything will go (within reason). Our installer will be happy to help you figure out device placement. If you are a Gigabit + TV customer, the final installation step will include installing the Storage Box right next to the Network Box and then hooking up each of the TV Boxes you’ve ordered. I’m not sure if I’ll still be in my house in a year. Tell me more about the contracts and terms of service. You can cancel your service any time before we begin construction in your fiberhood (only your $10 registration fee is non-refundable). If you own your home and are considering a move, you may want to think about Google Fiber as a home-improvement. According to the Fiber-to-the-Home Council, a fiber drop can add thousands of dollars in value to the appraisal value of a house. As always, if you have questions above and beyond what we’ve covered here, please visit us at 1814 Westport Rd., Kansas City, MO or get in touch with us at 866-777-7550. As we get closer to the end of pre-registration—and to our first customer installations—we’re getting a few very practical questions about devices and contracts. This blog post addresses some of these common Q&A’s below. How much will the TV boxes cost? in Kansas City. We’re really glad the response from the community has been so enthusiastic. Ninety-eight fiberhoods have qualified for service already. You can see the rankings on both sides of the border in Kansas City, Kan. and Kansas City, Mo. There are only 12 days left until the Google Fiber rally ends, and some fiberhoods still haven’t reached their pre-registration goals. Your community needs your help. Mobilize your neighbors, otherwise the opportunity to get a gig might pass you by. And remember, not only will you be able to enjoy Google Fiber at your home, your community will also see the benefits, since we’ll be connecting schools, libraries, hospitals and more in qualified fiberhoods. Pre-register if you haven’t already. All you need to do is provide some basic sign-up info and pay the $10 pre-registration fee. If your fiberhood qualifies, the $10 will count toward your first bill. If your fiberhood doesn’t qualify, we’ll return the $10 back to you. Encourage your neighbors to pre-register, too. Getting Google Fiber is a combined effort between your fiberhood and Google Fiber. If your fiberhood doesn’t hit its goal, we’re not sure if or when we’ll come back again. So it’s important for you and your neighbors to pre-register now, before the rally ends. You can still rally your neighbors even if your fiberhood has already qualified. The more pre-registrations there are in your fiberhood, the sooner we’ll install there. Pre-registration ends on September 9. Right after that, residents of qualified fiberhoods will be able to choose their Google Fiber packages. And within a few weeks, we expect to begin installing the first homes. So a Gigabit Internet is truly just around the corner. There’s not a lot of time left, and we’re eager to help you and your neighbors with as much information as you’d like about Google Fiber. If you want to become a Google Fiber Ambassador, fill out this form and we’ll get back to you shortly. You can also download informational flyers right here to print and share. And if you want a Google Fiber sign for your yard, come pick one up at our our Fiber Space at 1814 Westport Rd. where you can also see demos of what a gig can do, ask questions in person to members of our Google Fiber team, and get help with pre-registration. We’ll also be holding several events around town during the rest of the rally, including a pre-registration drive from 2:00 PM to 6:00 PM next Saturday, September 8 at the Fiber Space Lounge. Bring your friends and neighbors for some food and fun entertainment. Finally, as always, please check out our online FAQ or contact us by email, chat, or phone anytime. We’re here to help! Just over a month ago, we kicked off the Google Fiber Rally in Kansas City. We’re really glad the response from the community has been so enthusiastic. Ninety-eight fiberhoods have qualified for service already. You can see the rankings on both sides of the border in Kansas City, Kan. and Kansas City, Mo. Mi familia vino desde la Ciudad de México a Kansas City cuando yo tenía once años. No fue fácil. De repente, me encontré sumergido en una cultura nueva y, para empeorar las cosas, no sabía nada de inglés. Esto podría haber sido un grave problema para mi educación y desarrollo, pero lo que sucedió en su lugar es testimonio de la gran comunidad de apoyo que tenemos en KC. El Guadalupe Centers ayudó a mi familia a buscar un lugar para vivir, se aseguró de que había comida suficiente en nuestra mesa y colaboró a que mi hermana y yo entráramos a la escuela. Mi profesora de la escuela Northeast Middle School, Ms. Peterson, se esforzó todo lo que pudo para ayudarme a aprender inglés y a ponerme al día con mis estudios. Después de años de duro trabajo, recibí una beca para ir a la Pembroke Hill School, y más adelante pasé a estudiar en la Universidad de Kansas. Me cuesta trabajo imaginar cómo hacer todo esto sin acceso a Internet. Todavía recuerdo el día en que mi mamá nos consiguió nuestra primera computadora, y cuánto más fácil se me hizo el aprender, estudiar y permanecer en contacto con mi familia en México. Hoy trabajo en el equipo de Google Fiber aquí en Kansas City. Y ahora, más que nunca, creo que el acceso a Internet es esencial. La Web no es sólo para el establecimiento de una red social y para e-mail: consiste en encontrar y solicitar trabajos. Consiste en educación y gestión financiera inteligentes. Quiero poder devolverle a esta comunidad que me ha dado tanto, y ayudar a todos a tener acceso a Internet. Este artículo está escrito específicamente para aquellos de nosotros que hablamos español. Queremos que sepan todo sobre Google Fiber, las ventajas que podría traer a nuestra comunidad, y cómo pueden registrarse para recibir el servicio. Nuestro sitio Web está disponible en español. Para ver en qué consiste Google Fiber, cuánto cuesta y cómo conseguirlo, visita nuestra página Web en español. Contamos con materiales educativos en español. Ven a este sitio Web si quieres leer o descargar un folleto informativo con Google Fiber planes y precios. También tenemos folletos informativos en nuestro espacio Fiber Space en el 1814 de Westport Rd, de los que estaremos encantados de darte copias si nos visitas. Tenemos representantes de Atención al Cliente que hablan español. Quieren hablar contigo y contestar a tus preguntas acerca de Fiber. Llámalos al (866) 777-7550 y pulsa uno para español. La comunidad de Kansas City es muy importante para mí. Y deseo hacer todo lo que pueda para ayudar a que todos puedan conectarse. Si te interesa Fiber, aprovecha por favor estas oportunidades para obtener más información sobre el servicio. Y, si tienes preguntas, siempre puedes venir y hablar conmigo en el Fiber Space. Esperamos verte allí. My family moved from Mexico City to Kansas City when I was eleven years old. It wasn’t easy. I was suddenly immersed in an entirely new culture, and, to make matters worse, I didn’t know any English. This could have been a big problem for my education and development—but what happened instead is a testament to the supportive community we have in KC. The Guadalupe Centers helped my family find a place to live, made sure we had food on our table and helped my sister and me get into school. My teacher at Northeast Middle School, Ms. Peterson, went above and beyond to help me learn English and get me caught up with my studies. After years of hard work, I received a scholarship to the Pembroke Hill School, and later went on to the University of Kansas. It’s hard for me to imagine going through my journey without access to the Internet. I still remember the day my mom got us our first computer, and how much easier it made learning, studying and staying in touch with my family back in Mexico. Today I work on the Google Fiber team here in Kansas City. And now, more than ever, I believe that access to the Internet is important. The web isn’t just about social networking and email—it’s about finding and applying for jobs. It’s about smart financial management and education. I want to give back to the community that has given me so much, and help them get online. This post is specifically for those of you who speak Spanish. We want to tell you all about Google Fiber, the benefits that it could bring to our community, and how you can pre-register for service. Our website is available in Spanish. Visit our Spanish website to learn about what Google Fiber is, how much it costs and how to get it. We have educational materials in Spanish. Visit this website to read or download a brochure with information about Google Fiber plans and prices. We also have flyers with information at our Fiber Space at 1814 Westport Rd, and we’re happy to give you copies if you come visit us. We have customer service representatives who speak Spanish. They want to talk to you and answer your questions about Fiber. Give them a call at (866) 777-7550 and press one for Spanish. The Kansas City community is so important to me. And I want to do everything I can to help everyone get connected. If you’re interested in Fiber, please take advantage of all of these great opportunities to learn about service. And, if you have questions, you can always come and talk to me at the Fiber Space. Looking forward to seeing you there. Join us for "Back to School Day"
about technology and education, written by Dr. Cynthia Lane, superintendent of Kansas City, Kan. Public Schools. You can also tune in on our YouTube channel to hear some thoughts from fellow Kansas Citians. Please drop in and join us on Sunday and help spread the word to other faculty, students, and parents! School officially starts this week for many schools in Kansas City—so we’ve decided to celebrate this annual milestone with a “Back to School Day” of our own. Join us this Sunday, August 19th, at the Fiber Space where we’ll be hosting demonstrations and answering questions about what Google Fiber means for education in Kansas City. We’ve also lined up some unique local entertainment and treats for guests, including storytelling via telepresence, face painting, special Google Fiber schwag and of course, food. If you’re interested in the impact that Google Fiber can have on education and you can’t wait to join us on Sunday, you can learn more now. Check out this blog post about technology and education, written by Dr. Cynthia Lane, superintendent of Kansas City, Kan. Public Schools. You can also tune in on our YouTube channel to hear some thoughts from fellow Kansas Citians. , superintendent of the Kansas City, Kansas Public Schools. Cindy has over 30 years of experience in education, mostly in Kansas City, and is an advocate for leveraging technology in classrooms to create a better learning experience for students. She’s joining us now to talk about how the Internet can help enhance education for Kansas City students. Almost 100 years ago, the poet Kahlil Gibran wrote of children: “...Their souls dwell in the house of tomorrow, which you cannot visit, not even in your dreams.” When I think about the students in the Kansas City, Kansas Public Schools and about their futures, I realize that the world that they are growing into will be very much different than the world that my generation grew into. Life moves forward, not backward, and it is our job to help our students move forward into their world. To do this, we have a goal as a system: “Every student will graduate prepared for college and careers in a global society, and at every level, students will be on-track and on-time for success.” One of the things that every student will need to graduate prepared for college and careers is a strong experience with and ability to use technology. Unfortunately, in a district where more than 85% of our students are eligible for free/reduced lunch, many of our students would not ordinarily have access to technology at home. That is the reason that, back in 2007, our district made the decision to lease a laptop computer for every high school student. Now in the sixth year of the Laptop for Learning program, our students have used their laptops to move away from being merely “consumers” of information ten years ago, to being “producers” of information and knowledge today. Among other things, they have used their computers to create impressive multi-media presentations, to design provocative works of art, and to sequence DNA in a plant that had never been sequenced before. Even with this tremendous power in their hands, many of our students have suffered by not having 24/7 access to the full power of technology that comes from having access to the Internet. 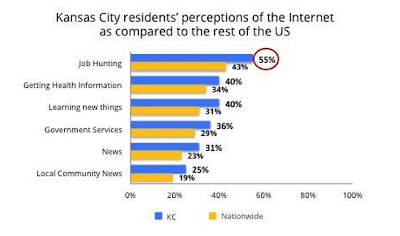 For that reason, I was thrilled when I learned that Google Fiber was going to bring high-speed connectivity to Kansas City, Kansas. Having access to blazing-fast Internet speeds, both at school and at home, will open up our students’ lives and accelerate their learning, in a number of ways. First, it will help to connect them to the world, allowing them to use technology both to see the world and to bring the world to them. Next, it will allow us to “flip” the classroom, giving students access to high-quality videos at home, where they can learn at their own pace, while classroom time can be used for practice, working collaboratively with other students under the guidance of their instructors. High-speed fiber will make a tremendous difference for this community and for our students. I am thrilled that Kansas City, Kansas has been given the opportunity to participate in the beginning of this amazing revolution. Ed. Note: From time to time, we invite guests to post on our Fiber blog. Today we’re welcoming Dr. Cynthia Lane, superintendent of the Kansas City, Kansas Public Schools. Cindy has over 30 years of experience in education, mostly in Kansas City, and is an advocate for leveraging technology in classrooms to create a better learning experience for students. She’s joining us now to talk about how the Internet can help enhance education for Kansas City students. to be clearer about which channels will be offered with our Gigabit + TV package. Right now there are about 185 channels included, and we’ll continue to add more of your favorites over the next few months. So, for $120, our Gigabit + TV subscribers will get all of these channels, along with a new Nexus 7 tablet (which doubles as your new remote) and ultra fast Gigabit Internet. You’ll also get HD content and a DVR with 2TB of storage that can record up to 8 shows at a time for no extra charge. And remember, for this package we’re waiving the $300 construction fee. For our TV customers who are also movie fans, there’s more. We’re excited to offer both Starz and Showtime as optional add-on packages. Both packages are full of popular HD movie channels, with enough action, drama, and family-oriented programming to keep movie lovers happy for years. Our Gigabit + TV customers can add on 17 Starz channels for an additional $10 per month. They can also add on 11 Showtime channels for an additional $10 per month. Finally, our TV service already offers some great Spanish-language programming. But we’ll also have some additional popular Hispanic channels available for an additional $5 per month, including Univision tlnovelas, Bandamax, and Telehit. All of these channels are also listed on our website, which we’ll continue to update with more information as we add new programming. Stay tuned! If you love TV—and want to learn more about Google Fiber TV—then today’s blog post will be right up your alley. On our website we’ve updated our Plans & Pricing page to be clearer about which channels will be offered with our Gigabit + TV package. Right now there are about 185 channels included, and we’ll continue to add more of your favorites over the next few months. So, for $120, our Gigabit + TV subscribers will get all of these channels, along with a new Nexus 7 tablet (which doubles as your new remote) and ultra fast Gigabit Internet. You’ll also get HD content and a DVR with 2TB of storage that can record up to 8 shows at a time for no extra charge. And remember, for this package we’re waiving the $300 construction fee. As Director of Service Delivery for Google Fiber (a.k.a Customer Service), I’ve been thinking a lot about you, Kansas City. I joined the Fiber team last September after almost 10 years in sales & operations at Google because I wanted to treat you better. Sure, I was excited to improve support in a historically service-challenged industry. But most of all I was excited to transform your day, especially when something needs fixing. From sign-up through payment and installation, customer support can be better. Much better. I bet I know what bothers you because it bugs me too. I don’t want to wait on hold. I don’t want to talk to a phone system. I want to talk to one human who knows the answer and can solve my problem quickly. I also want good chat and email options for the times when I can’t talk. When you come to my house, I want you to respect my time and property. And please give me an option of somewhere local where I can talk to you face-to-face. Respect me, and I’ll reward you with my business for years to come. Day by day, we’ve been making this possible. I hired a great team—a close-knit combination of Google Fiber team members spread across Mountain View, Austin and Kansas City. These are all people who have something to prove; we want to solve problems and change your mind about customer support. We’re training our whole team on friendly processes and smart tools, so that any one of us can handle almost any call. We’re also focused on getting your installation right by showing up when we say we will and doing the job right the first time. We want to surprise you (in a good way). Right now we’re focused on answering your rally questions, particularly for those of you in fiberhoods whose addresses are not yet recognized by our system. We know resolution there has been slow, and we’re speeding that up. Keep the feedback coming, and we’ll keep learning and improving. I won’t lie—customer service is hard to do at scale and harder to do with a new product. But hard isn’t impossible, and really, it’s our job. No excuses here. Call us, email or chat; we can’t wait to hear from you. , Kansas City Kansas Community College and Indian Springs Mall. 1. When I tried to pre-register for Fiber, I had to submit my address for review. This was a few days ago and I haven’t heard back yet. What’s going on? Don’t worry—we have your request and we’re getting to it. We want to make sure we’re thoroughly reviewing every address we receive. This process takes time, but we’re increasing the number of people on our team who are working on this, and we’ll get back to you shortly. 2. I live in an apartment building and I keep getting a pre-registration error. What should I do? We’re sorry about the inconvenience. We know that we’re having a processing problem with some unit numbers in apartment buildings, but we’re working to fix it. Be sure to fill out our address review form and we’ll get back to you within a few days’ time. 3. I own and rent out property and I want to get Google Fiber. What should I do? First, ask your tenants to pre-register for Google Fiber. Then, please visit this website and provide us with your contact information. If your fiberhood qualifies, we’ll be in touch with you to discuss the details about hooking up your building(s). 4. I completed my pre-registration without having to pay $10. Am I still pre-registered? No. If you did not enter your credit, debit or prepaid debit card, you did not complete the pre-registration process yet. Please visit fiber.google.com and pre-register now. Hopefully this helps. And, as always, if you have any other questions you can just give us a call, chat with us or email us and we'll help you out. Or come see us at the Fiber Space, 1814 Westport Road in Kansas City, MO. Welcome to the second full week of the Google Fiber rally! So far this week we’ve had some great conversations with Fiber-curious Kansas Citians at our Fiber Space and throughout the community at locations like the Plaza Library, Hyde Park, Kansas City Kansas Community College and Indian Springs Mall. 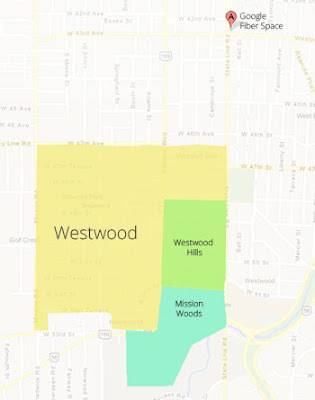 Our new Fiber communities: Westwood, Westwood Hills and Mission Woods, Kan.
To be clear, this does not change the construction schedule for eligible homes in Kansas City, Kan. and Central Kansas City, Mo. And homes in North and South Kansas City, Mo. will still be able to pre-register for Fiber in our second rally. Today we are simply adding three new Google Fiber communities for a future rally. To our new communities, welcome! And to Kansas City, Kan. and Kansas City, Mo., keep the pre-registration going. We can't wait to bring a gig to your fiberhoods soon. We’ve been so excited about the number of pre-registrations, visitors to our Fiber Space, and amount of feedback that we’ve seen over the first week of the Google Fiber rally. Your enthusiasm is contagious—and we’re going to help it spread. Next week, we hope to welcome three more communities in Kansas into our Google Fiber service area. We’re happy to announce that we’ve reached a tentative agreement to bring Fiber to the cities of Westwood, Westwood Hills and Mission Woods, Kan. Pending approval from each of the three City Councils, we plan to include these communities in a future rally for Google Fiber (timing to be announced, so stay tuned). in Kansas City, Kansas and Kansas City, Missouri, and we’ve been blown away by the community’s reaction. So far, 40 fiberhoods have qualified for service, more than 2,000 people have visited our Fiber Space, we’ve talked to thousands of people via online and phone customer service, and we’ve distributed upwards of 2,000 ice cream sandwiches from our Fiber trucks. Through our many conversations, we’ve noticed that some details about Google Fiber may still be a little unclear. So today we’re going to share and answer some of the top questions we’ve been getting about Google Fiber, so that we can keep everyone up-to-date in Kansas City. 1. When are you building to North and South Kansas City, Mo.? Our first pre-registration phase includes homes in Kansas City, Kan. and homes in Central Kansas City, Mo. But we are definitely committed to serving homes in North and South Kansas City, Mo. in our second pre-registration phase. Residents should stay tuned to google.com/fiber and this blog for more information. 2. I have a business and I can’t pre-register. Why? We’re focused on making residential connections right now, but we’ll have an announcement about a small business offering soon. 3. How did Google determine fiberhood pre-registration goals? Like many of our projects at Google, we relied on data. All fiberhoods are different. They range in size and density as well as speed and ease of Fiber construction. For example, houses that are spread out (like in the suburbs) require more time, fiber and labor, and therefore are more difficult to connect than homes in a dense urban environment. So, in those fiberhoods that are more complicated to build, we want to make sure that enough residents will want Fiber service. We don’t want Fiber to be out of reach for anyone—it’s our hope that the pre-registration goals will be practical and attainable. 4. Help! I’m in a fiberhood but I keep getting a pre-registration error. There are two possible issues here that we're working hard to fix. Some addresses (mostly apartments) with unit numbers are causing errors during pre-registration. Also, the "submit address review" form doesn't always work. In either case, please give us a call, chat with us or email us and we'll help you out. 5. What if I don’t have access to the Internet to learn about Fiber or pre-register? We know that 25% of Kansas Citians don’t have access to broadband at home. So, to help spread the word about Google Fiber, we have a dedicated street team that visits fiberhoods throughout Kansas City, Kan. and Kansas City, Mo. Our teams pass out flyers (and ice cream! ), answer questions about Google Fiber and help pre-register anyone who is interested. Look out for our Google Fiber trucks in a fiberhood near you. We also have a local building, or Fiber Space, that Kansas Citians can visit. Google Fiber team members are there every day of the week to answer questions and help with pre-registration. 6. Why is the construction fee for the Free Internet service so expensive? What do I do if I can’t afford it? As a Google Fiber customer, you will have a gigabit-ready Fiber cable routed to, and built directly into, your home. Studies show that simply having this connection will add value to your home and will put you on the cutting edge of broadband technology. We’re charging $300 for this construction. To make the construction fee more manageable, subscribers can break it into payments of $25 per month during the first year, and free for at least the next six years. Over time, this Free Internet service is very affordable—it works out to an average of $3.57 per month over seven years’ time. 7. Why do I have to pay $10 just to pre-register? Your $10 pre-registration fee will be applied to your Google Fiber service. If your fiberhood qualifies for service, your $10 will go directly to either your first month of service fees (for our Gigabit +TV or Gigabit Internet plans), or to your $300 construction fee (for the Free Internet plan). If your fiberhood does not qualify for service, your $10 will be refunded. 8. How did you choose which public buildings you would connect for free in each fiberhood? When we announced that we’d bring Google Fiber to Kansas City, Kan. and Kansas City, Mo. we also committed to building free, 1 Gigabit per second connections to the cities’ choice of public buildings. Both cities collaborated on a list of the public buildings that they wanted to connect, and then they gave the list to us. We will bring Fiber to these buildings that are located in qualified fiberhoods. • Read our online FAQ, which has a lot of common questions and answers. It’s been five days since we kicked off the Google Fiber Rally in Kansas City, Kansas and Kansas City, Missouri, and we’ve been blown away by the community’s reaction. So far, 40 fiberhoods have qualified for service, more than 2,000 people have visited our Fiber Space, we’ve talked to thousands of people via online and phone customer service, and we’ve distributed upwards of 2,000 ice cream sandwiches from our Fiber trucks. that we wanted to provide a community with Internet access more than 100 times faster than what most Americans enjoy today, we asked who was interested in working with us. More than 1,100 cities raised their hands, and those of you in Kansas City, Kansas and Kansas City, Missouri won us over with your enthusiasm for better, faster web connections. Today as we launch Google Fiber in Kansas City, we’re continuing with the same approach. Instead of us deciding where and when we install, we’re asking you. 1. Pre-register: Starting today, if you live in an eligible Kansas City household, you can pre-register by visiting google.com/fiber. All you need to do for pre-registration is provide some basic information (like your name and address) and pay a $10 deposit. 2. Rally your neighbors: Over the next six weeks, get your neighbors and friends to pre-register too. After the rally, we’ll let you know if your fiberhood has reached its goal. If so, you can sign up for your service package. The first homes will get service shortly after the rally ends, and all qualifying neighborhoods will receive service before the end of 2013. In the meantime, you can come visit Kansas City’s Google Fiber Space, where you can experience a gigabit first-hand and check out TV in crystal clear high definition. The Fiber Space will be open daily starting this Saturday, July 28. We’ll also be holding events throughout the community during the rally. Stay tuned for more on the Google Fiber KC Blog. When we announced that we wanted to provide a community with Internet access more than 100 times faster than what most Americans enjoy today, we asked who was interested in working with us. More than 1,100 cities raised their hands, and those of you in Kansas City, Kansas and Kansas City, Missouri won us over with your enthusiasm for better, faster web connections.
. It turns out you want speed, choice, great content and simplicity. In less than 24 hours, we'll make a special announcement about Google Fiber. Tune in on YouTube tomorrow at 11AM CDT to watch a livestream of the event. If you want to stay up-to-date on Fiber in Kansas City, you can also follow us on Google+ and on Twitter. Kansas City: Google Fiber is almost here. Look out for more information on July 26th at google.com/fiber.